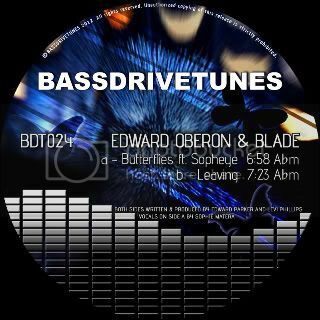 BassdriveTunes kicks off 2012 with two HUGE tunes from collaboration of musical styles, talents and skills of Edward Oberon and Blade! Both producers being well accomplished musicians and already known to us from their various releases on multiple labels, we are very excited about putting out their collective work and making such wicked tunes available to Drum&Bass enthusiasts worldwide! [BDT024] warms your heart with perfect blend of sounds brought to you by Edward Oberon and Blade. “Butterflies” on the a side features hauntingly sultry vocalistic works of very talented and lovely SophEye, layered brilliantly with melodies of the keys and crescendo of sounds leading up to a resounding drop that will stir up your deepest emotions. It will grab and move you and make you look forward to the better days to come. On the flip side is an exquisitely lush tune called “Leaving” which flowery descriptive words just won't do it justice.. just take a listen and you will all agree! [BDT024] Edward Oberon & Blade - "Butterflies" feat. SophEye / "Leaving" is OUT NOW and only available exclusively at http://www.bassdrivetunes.com! Start your BassdriveTunes 2012 experience off right by grabbing our first release of the year RIGHT NOW!!! It’s good to see a post like this, that shows the writer is committed to providing value! You honestly made me think! Thank You for write such a nice article. Looking for Best Dental implant in india? Visit Ekdantam Dental Clinic.